North Shore Animal League America, the world’s largest no-kill animal rescue and adoption organization, held its annual Celebrity Gala on Friday, November 18th at The Mandarin Oriental in New York City. The evening included a wonderful group of attendees from all sectors of New York’s animal-loving community and beyond. Comedian/Actress Pam Stone served as host for the evening and musical guest and renowned animal advocate Belinda Carlisle completed the evening with a crowd pleasing performance. Among the “bold face names” to stride the red carpet, in addition to Beth Stern and Howard Stern were, Today Show Host Matt Lauer, “Orange is the New Black” actor, Peter Rini, Stage and Movie Actress & Playwright Mara Wilson; Comedienne, playwright and former Animal League America Gala Host, Lisa Lampanelli, WNBC-TV Weather Anchors Janice Huff and Chris Cimino, WNBC-TV Reporter, Lauren Scala, Hot 97 and ESPN Radio Host, Peter Rosenberg, New York Mets Sideline Reporter, Alexa Rosenberg, New York Yankees play-by-play TV announcer and ESPN radio host Michael Kay; Michael’s wife, broadcast journalist Jodi Applegate; Director, Producer, ABC Channel’s “All My Children” Star, Ricky Goldin; President & CEO of Crown Media Family Networks, Hallmark Channel, Bill Abbott; Published Author and TV Personality, Carole Radziwill; WPIX-11 weather anchor Linda Church; Celebrity Chef & Cookbook Author, Katie Lee; TV producer, entertainer and comedian, Brian Balthazar; WPIX-11 Evening News Anchor, Tamsen Fadal; WABC-TV News Reporter, Jim Dolan; Celebrity Chef and New York Times bestselling author, Rocco DiSpirito; iHeart Radio Personality Maria Milito; FOX-5 New York Weather Anchor, Audrey Puente; Co-Founder & CEO of Next Step Realty, Blair Brandt; Co-Founder, Chairman, and CEO of Concordia Summit, Matt Swift; President, Canine Company, Jennifer Hill; Producer, Howard Stern Show, Gary Dell’Abate; Chief Meteorologist, Fox 5 New York, Nicolas Gregory, and others. 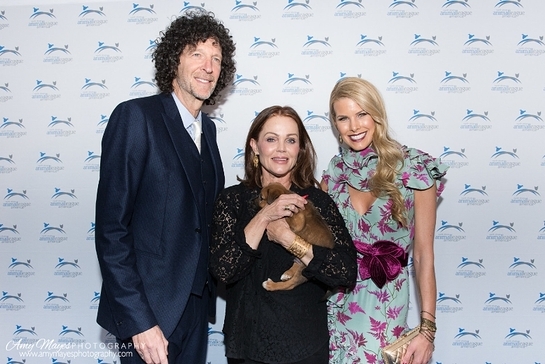 The Gala supports North Shore Animal League America’s ever-expanding no-kill mission with all proceeds from the event dedicated to Bianca’s Furry Friends Feline Adoption Center. This 14,000-square-foot, state-of-the-art facility will enable Animal League America to rescue many more animals by adding a second floor to the existing shelter that will host a cage-free, natural living environment for felines. In addition, this expansion to the shelter will open up space on the first floor to increase the number of dogs they take in and enrich their lives. Overall, this project will enable them to provide the best quality of life for all the animals in their care while they await adoption into loving homes.